I hope everyone had a wonderful holiday and that the New Year is the best one yet. I might have taken a break from reading and possibly rotting my brain on HGTV but nothing was grabbing my interest. I started some books but eh. I wanted to read something that was better than eh on my time off from school and work. 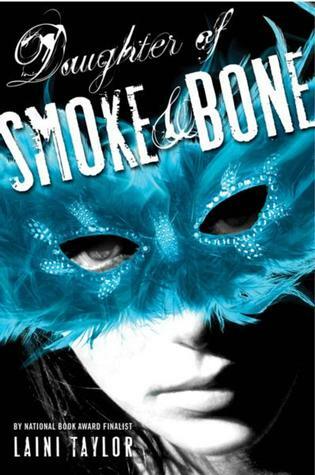 An acquaintance had mentioned that if I loved Cinder, I would probably like Daughter of Smoke & Bone by Laini Taylor. I’m not ashamed to admit it, I wasn’t completely sold and girlfriend got it wrong. I LOVED Daughter of Smoke & Bone and it most definitely resulted in me reading past my bedtime. And yes, I am so late getting onto the bandwagon but so many books, so little time. Karou fills her sketchbooks with monsters that may or may not be real, she’s prone to disappearing on mysterious “errands”, she speaks many languages – not all of them human – and her bright blue hair actually grows out of her head that color. Who is she? That is the question that haunts her, and we are about to find out. Now, I won’t claim that the premise of the story is original. Girl feels like something is missing meets tall, drop dead glorious, guy who helps her to uncover the truth but son of a nutcracker the writing is intoxicantly fantastic. One of my favorite lines is: “I don’t know many rules to live by. But here’s one. It’s simple. Don’t put anything unnecessary into yourself. No poisons or chemicals, no fumes or smoke or alcohol, no sharp objects, no inessential needles – drug or tattoo- and … no inessential penises, either.” lol There was just no way to put this down. The characters and the world that Taylor has created are exotic and instantly I was hooked to see where all of this was going. Taylor sets up the unraveling of who Karou is like an onion, delicately peeling away the layers until mind blowing goodness. And yes, I am reading book two now. This entry was posted in Magic, Monsters, Young Adult and tagged Daughter of Smoke & Bone, Daughter of Smoke & Bone Book 1, Laini Taylor, magic, monsters, Young Adult. Bookmark the permalink.